Computed tomography (CT) scan of the abdomen; drawing shows the patient on a table that slides through the CT machine, which takes x-ray pictures of the inside of the body. Computed tomography (CT) scan of the abdomen. 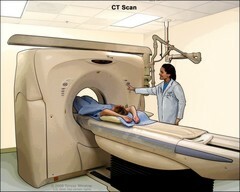 The patient lies on a table that slides through the CT machine, which takes x-ray pictures of the inside of the body.